I was up to my elbows in dishwater the other morning when my oldest granddaughter came bursting in. Then I realized that whether he was or not, the child was upset and I needed to go check on things, so I dried my hands and followed her out to the chicken pen. Sadly, she was correct—the chick must have been just about gasping his last when she saw him, for he was dead but still warm when I picked him up. The little body lay limply in my hands, the source of death clear from the multiple bloody wounds on his body. He had been pecked to death by the other chickens. I gave what comfort I could to my granddaughter (who was as upset with me as with the chick’s death, since I had turned him loose in the pen), buried the chick, and thought about what had happened for the rest of the day. Marshmallow started life as one of two siblings. They hatched within hours of each other and probably because there were several hens setting in relatively close quarters, other hens tried to steal the chicks from their mother. One chick lost an eye in the resulting melee, and Marshmallow’s mother deserted him to go back and set on another nest of eggs, completely ignoring her offspring. I dispatched the injured chick, which had such severe injuries it could not be saved. Marshmallow went into my daughter’s house—my four cats posed too great a hazard. He was raised in their living room until he had feathered sufficiently to be outside, then graduated to the front porch. The three girls fed, watered and cleaned up after him, spent much time watching him and generally accorded him status as a member of the family. A few months later another abandoned chick, named Daffodil, joined him in the live trap we had pressed into service as a chick cage. Knowing that chickens don’t always readily accept new members to the flock, we placed the live trap in the big chicken pen and gave them a month or so to begin to get acquainted. 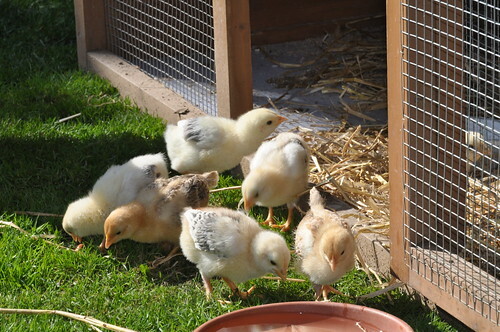 Eventually I felt it was time to put the young chickens in with the older flock. My granddaughter disagreed, but I prevailed, reminding her that chickens lived in flocks and we couldn’t leave the two young ones separate forever. There were a few squabbles, but things seemed to be working out until the morning she found Marshmallow in extremis. When you make a mistake like this, all you can do is try to learn from it. In retrospect I can see that it would have been better to give the two chicks more time in the pen but still separated from the older hens. Another preventive measure might have been to separate them at night, and a third to keep a closer eye on the interactions—it is likely that the chick was being bullied or harassed and we simply did not realize it. And finally, when my granddaughter held out for keeping them separate, it would have been better to let her make the decision; this was a chick to which she had become closely attached due to the circumstances surrounding his raising, and the death of a chick she had hand-raised made the loss much harder on her. This small tragedy also led me to speculate on the whole issue of newcomers to the flock or herd, and the implications for newcomers to the human community. Animals and birds that live in groups tend not to do well in isolation. To keep one separate from the group may lead to fretting, weight loss from pacing, or bad habits such as wood chewing or constant pawing. Anyone with animals has watched as a new cow, horse or chicken goes through the initiation process when first introduced to the herd or flock. There are squeals and kicks or pecks, posturing, chases and squabbles. The new one must generally accept last place at feed or water and it may be a long time before one of the four-footed old-timers will stand head to tail and companionably switch flies. There are exceptions—I remember when we introduced into our herd a mare who had always been the alpha mare; we already had an alpha mare, and the two fought it out until the new mare won. But more commonly, a newcomer, whether animal or human, must always be other, and may retain that status for years. Many a person has come to live in a small community, gone through the usual settling-in process and to all appearances been accepted. Yet after twenty years, she is still an outsider. Not born there, and so no matter how long the residency, still and always other. Perhaps it is a survival mechanism—the other may bring disease to the herd. Perhaps it is an innate reluctance to surrender hard-won status to this unknown outsider. It may be male on male rivalry, but if that is the case, why wasn’t it the rooster which killed Marshmallow? Or did the rooster, like a Mafia don, let it be known this newcomer was outside the pale, condoning the abuse heaped on by the hens in the flock? And what of humans, who can mimic the behavior, as anyone who has ever been the new child at school can tell you—are we to be held to the tenets of the herd or flock or will we someday learn, if not to welcome, at least to provide friendly neutrality toward the other?